Airtel has yet introduced a new package called SmartRecharge, which is also tagged as #DoAnyHow. 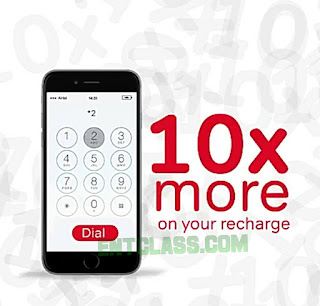 This package offers subscribers 10times the value on your recharge for voice and data. There have been video advert going on regarding this package. It explains more on how the package works as well as how to activate it. This package is more better than SmartConnect 2.0 that gives just 6times bonus and SmartConnect 4.0 that gives 8times bonus on any recharge. Airtel is really trying to take the position of grandmaster of Voice plus Data, which at the same time will attract new customers to them. Airtel SmartRecharge is yet another awoof package that offers you 10 times value or bonus on your recharge amount. Call. Connect. Download. With smartRecharge we give you 10times more on your recharge value for voice and data! Now you have even more to Stream. Dance. Sing. Basically Do AnyHow! Dial *220*PIN# to recharge and get your bonus today! #DoAnyHow. 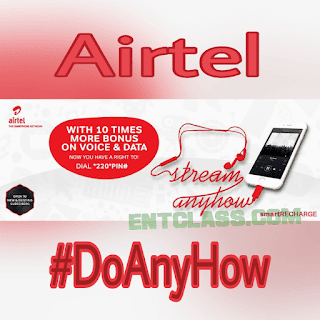 On Airtel SmartRecharge, if you recharge N100, you’ll get N500 for calls and N500 for data. If you recharge N200, you get N1000 for calls and N1000 for data. If you recharge N500, you get N2000 for calls, N3000 for data plus extra N3000 for data. If you recharge N1000, you get a massive N2500 for calls, N7500 for data plus extra N7500 for data. As you can see, you get more voice and data bonuses the more you recharge. Interestingly, this offer is not sim selective. That is, all new and existing customers are all eligible for the offer. It's very simple. Just dial *220*Rechargepin# and send, to get your own bonus. How do you see this package? Cool or not? Meanwhile, Ajayi Oluwaseyi, iam Manuel, Korion, Oluseyi Isaac and adeolu emmanuel should drop their phone number and network. How much per kb is charged on the data? Cn i stl use d 1k to sub for monthly data ? Wow, they reduced it a bit and made it official. I'v been using a similar offer for months, although it was very selective. I can say it's really worth giving a go but by-the-away they did not state the validity period here, hope it's equally upto a month. I really commend airtel, they've been my GOTO network in recent months. This offer is very useful but I hope they remain consistent and not wakeup one day and decide to wipe it off. Kachy do you know the validity period? It's very important cause these ISPs are very tricky. They didn't specify that. But I don't think it has anything to do with validity period. Airtel is coming up trying to get customers through Bonus. It's cool. But it's airtel we are talking about. The grandmasters of data zapping. Won't be surprised if the call credit is zapped as well. Eyes open my guys. this offer is nice from them I pray it last long. Airtel network is taking over from glo network now with this their package and speedy network. Wow! This package is very much cool. Awesome, really I like the improvement cause I use that 6X plan a lot when I run out of data. Since they stopped deducting my airtime I prefare airtel to other networks.